What we do best! After all we are the number one fender specialists in Europe. Whatever sized craft you have we have the boat fenders for you. Use our handy filtering system to find your fender by size, colour, shape or recommended boat size. But if in doubt email or call us. We are always happy to help and we know an awful lot about fenders! Shop here for all standard, cylindrical fenders. Including fenders with two eyes, single eye fenders, hole through the middle fenders. For all sizes of boat and craft. This great fender doubles as a handy step! The Fender Step has a non-slip surface at the top to prevent accidents while climbing on and off your boat. Our Bow Fenders stay in position well for bow protection. An extremely versatile Multifender which can be used on sides, stems, pontoons, swim platforms. Developed and designed exclusively by Compass Marine this Rib Fender is made from shaped EVA foam and is proving a must for owners wanting to protect the tubes on their ribs or any inflatable tender. Exclusively designed and developed by Compass Marine, Stem Fenders can protect the entire length of the stem of your boat and help to save hundreds of pounds in repairs. Fenders for the heaviest Narrowboats & Barges to the smallest River Craft. Dock fendering adds a layer of protection for your boat during rough weather and makes mooring easier for single handed yachtsmen. 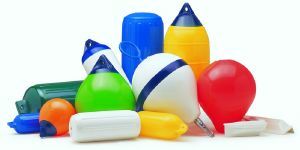 This ingenious little item offers protection for the boat from the anchor.